CAMBRIDGESHIRE-based construction materials supplier and utilities sector contractor G. Webb Haulage Limited, is refreshing its fleet with 12 new Scania tippers. Being supplied by TruckEast Limited, Scania’s dealer for East Anglia, the order comprises a mix of P- and G-series new generation Scania rigids, all of which will be in service by May. Six of the vehicles are day-cab P 410 B8x4HZ XT models with low-sided lightweight steel tipping bodies by Charlton Bodies Limited, and six are sleeper-cab G 410 B8x4HZ XT models with bulk tipping bodies by Aliweld Limited. Both vehicle types feature Scania’s 13-litre DC13-141 engine which delivers 410 horsepower at 1,900 rpm and 2,150 Nm of torque at 1,000-1,300 rpm. “We have been introducing more and more Scanias into our fleet since they launched their Euro 6 engines in 2011,” said G. Webb Joint-Managing Director, David Webb. “The previous range was excellent on fuel, but the new generation is nothing short of fuel-fantastic! We would expect around 8-8.5 mpg on the kind of work we do, but our new generation Scanias are returning more like 9.5-10 mpg – they make a case for themselves on that basis alone. The P-series vehicles in this order will be operating primarily on short-haul quarry work, recycling and muck-away, while the G-series trucks will be running on contaminated waste transport and ‘cake’ transportation for utility companies. These operations include longer distance work, hence the specification of sleeper cabs for drivers on nights out. 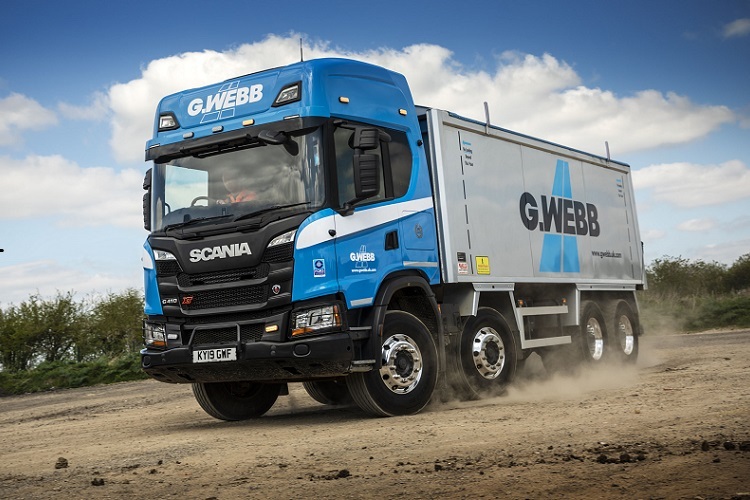 Formed in 1947, G. Webb Haulage Limited today is a FORS Silver operator with 65 trucks, over 40 of which are Scania. The fleet predominately comprises eight-wheel rigids, plus three heavy haulage Scania tractors which are mainly used to transport the company’s own plant and machinery. The firm is planning to keep its new Scania rigids for up to eight years. TruckEast Ely will fulfil the two years repair and maintenance contract included in the deal, and thereafter will continue to provide service support for the vehicles’ entire lifetime with G. Webb Haulage Limited.